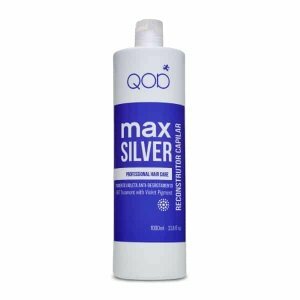 QOD Max Silver improved formula was developed with key ingredients, like a blend of acid proteins that guarantee straight effect and unique shine, resulting in an incomparable hair treatment. Its violet pigment protect blonds, blanched and highlighted hairs avoiding the color fading and the yellowish effect. Wash the hair with QOD Cleansing Shampoo. Repeat the process for better performance, however for clients with colored hair we recommend 1 application of cleanser is sufficient. Remove 60% of the humidity of the hair with the help of a blow-dryer using fingers. After the hair is dried, section hair (forehead to nape and then ear to ear). Beginning at the back section, take 1/2 inch sections, put approx. 30ml of QOD Max Silver in a small receptacle and dust QOD Treatment with color brush from root to tip, then comb through. Use a fine tooth comb to better spread the product along the hair fiber. Let sit according to hair type, see table below. Begin at back section and take 1/2 inch sections passing the straightener over 10 to 15 times per section until all hair is straightened. (Temperature should be between 180-200 degrees). Explain to client not to get hair wet or damp and not to tie it up. Leave for at least 24 hours (max 48 hours). Wash out with QOD Sodium Chloride Shampoo and Condition with QOD Deep Moisturising Conditioner. NB: Clients must use specially formulated QOD aftercare shampoo and conditioner to guarantee the 16 week longevity.